Theater in the Now: Review: Aca-Huh? Music is a universal entity that brings people together. We sing to celebrate. To mourn. To rally. Virtually use any verb and music will relate. The human voice is a stunning instrument. The things you can do with it. Especially when it comes to acappella. 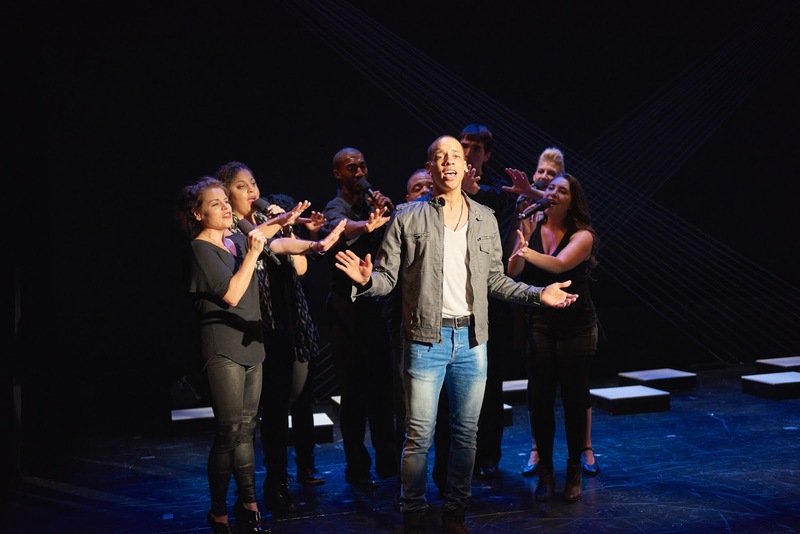 But in Acappella by Vynnie Meli, and the Acappella Company, it's more of a celebration of the sound rather than a book musical in a musical theater festival. 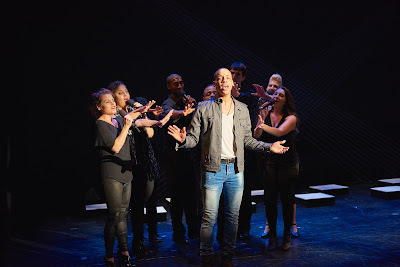 Acappella, conceived by Greg Cooper, loosely follows Jeremiah as he returns home after hitting the big time, forgetting his gospel roots. And that's virtually all there is to it. Fitting the musical formula doesn't always need to happen but this is not a musical. A concert, maybe. A play with music, perhaps. A musical, by no means. The book by Vynnie Meli was a story that was not very new. The idea of a star returning home to mixed reviews and the past catching up to him has been done to death. Meli didn't offer anything fresh. With a thin book to begin with and some poor lead-in lines, there was an ambulance of cringe-worthy moments. But with an incredibly vibrant sound from the performers, the audience didn't care how bad it was. There is no denying there was immense vocal talent on stage. From the non-handheld mic actors to the vocal band, power was the name of the game. With poor book material, the acting cast did all they could. Tyler Hardwick as Jeremiah had great conviction and defined his pop star status through his voice. As Aunt Leona, Cheryl Freeman had fun and found the most depth of any character. Darilyn Castillo and Anthony Chatmon II as Sarah and Simon struggled with the feebleness of their parts. Chatmon's Simon played angry all the time while Castillo's played decisively indecisive. The reason audiences may fawn over this show are the arrangements. Music Director and Orchestraor Evan Feist filled the space and used their individual strengths of the company. But strip that away and the flaws of Lee Summers direction are exposed. Summers couldn't lift the material and swept the problems under the sound of the title. He strings along the few bits of dialogue between songs and rushes us right into the next rousing number. Finding ways to bring something new out of the tired material would have made Acappella more than just a celebration of the sound. Acappella needs some severe work if you wants to remain a stage piece. You can forgive a dismal book with a strong score but there’s too much missing here.